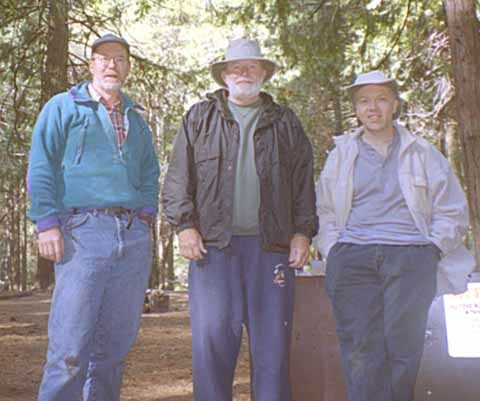 For some time I had been talking with my friend Scott about California hiking, especially since he and his wife Nancy had come to visit me when I had been living in Fremont (the Bay area). With spring coming in a few months and no other trip imminent, Scott and I talked abut a couple of weeks hiking and camping. Then we made the necessary arrangements for the coming May. 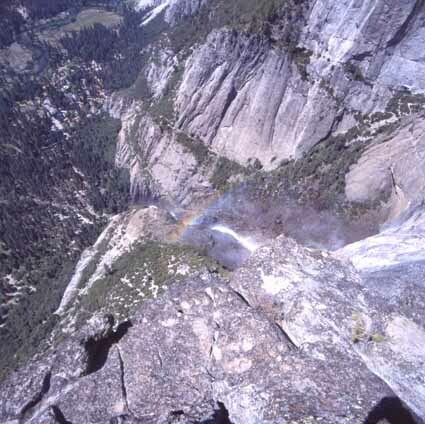 As you might already know, Spring is the best time for visiting Yosemite if waterfalls appeal to you. 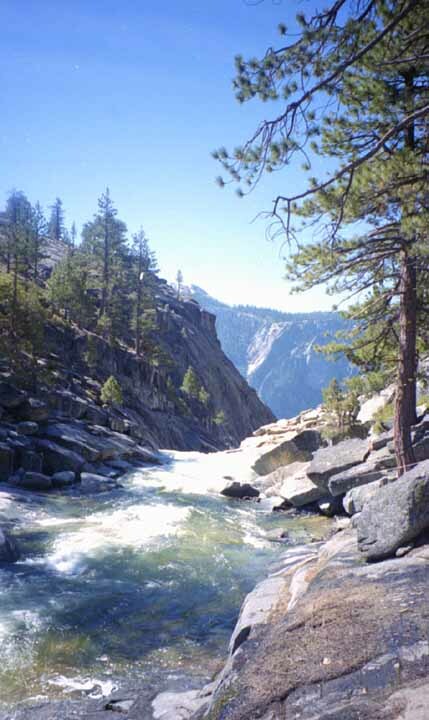 The Spring runoff is often tremendous - everyone should see the park this way at least once. 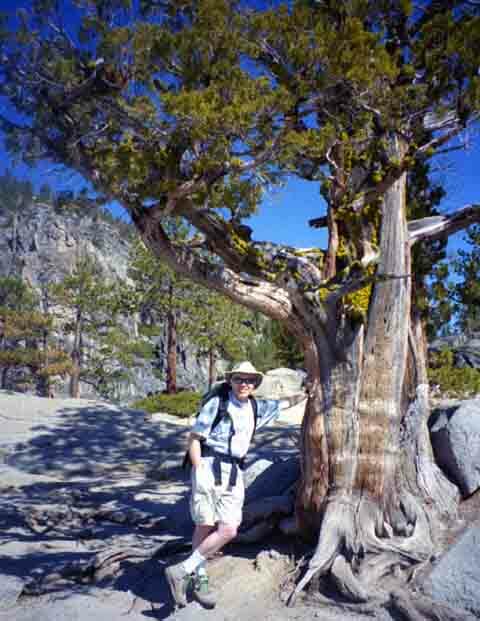 Basically, we planned to spend the main chunk of time in Yosemite, and then take a side trip to Death Valley, as Scott had never been there before. After landing in San Francisco, we did the usual shopping thing for stuff that can't go on airplanes, such as Styrofoam coolers and stove fuel. Then we headed out. In Upper Pines campground we had a very nice neighbor, Hank, who had been coming there for years with his wife. Retired from Firefighting, he was enjoying life considerably, it seemed to us. Very pleasant conversations and stories abounded. 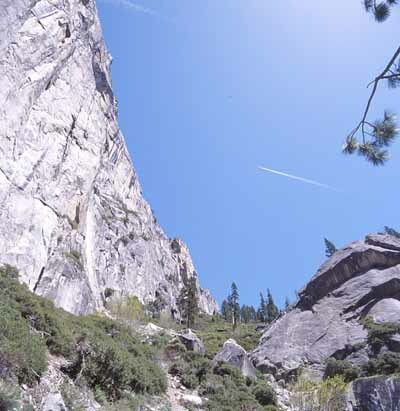 We set out early with plans for Yosemite Point, which is about another hour's hike from the top of Yosemite Falls. 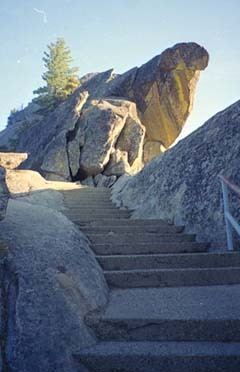 Columbia Rock had its usual grand view. Then there was the usual arduous hike through the talus switchbacks to the top of the falls. We made very good time, and made it to the top of the Falls by about 11:30 a.m. Here we pumped water to fill our containers, and had lunch while lounging on flatrock near the streams edge between the bridge and where it jumps into space. 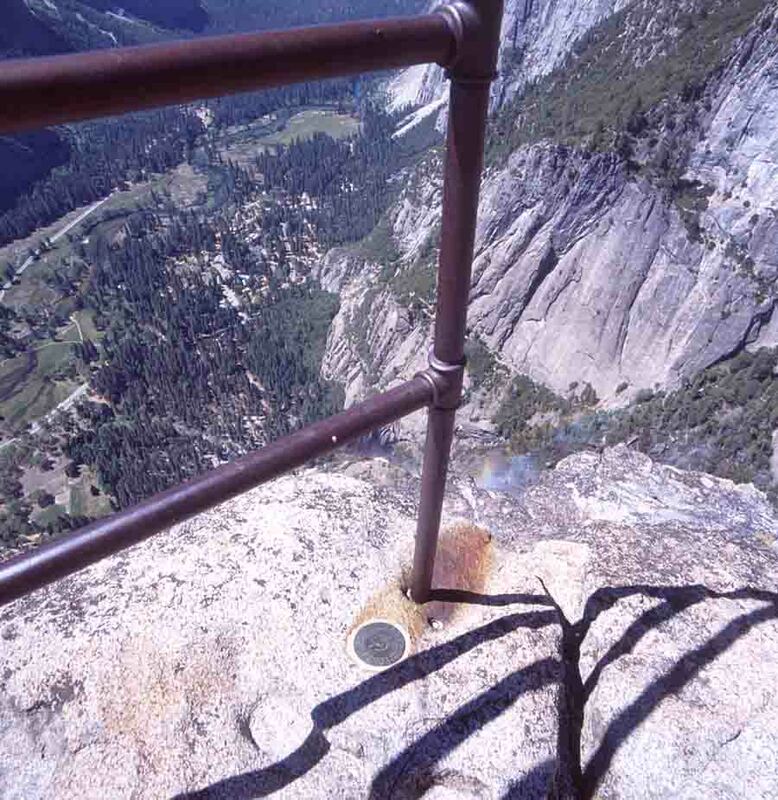 After lunch, we pressed on to the tip of Yosemite Point, with it's panoramic views of the entire valley, including Lost Arrow, seeming far down the wall. The round medallion is a U.S. Geological Survey marker from the turn of the century (not 2000). 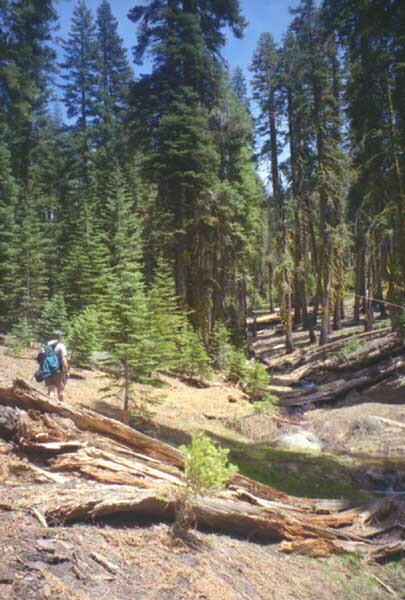 Because it was still quite early in the day, we decided to head along the trail toward North Dome, with an eye to maybe returning to the valley floor by way of Snow Creek instead of retracing our steps. The trees thickened up shortly, and soon we were hiking up and down in the forest over three sets of cuts, with a stream a the bottom of each. With the exception of three people and one bear at a distance, it was pretty quiet. The sun was out in full, and the air was warm, despite lingering snow in some of the smaller well shaded areas. Eventually, we reached a turnoff to North Dome, on the Topo map being a steep rise to get to the top. Instead, we kept on the main trail heading up onto Indian Ridge. 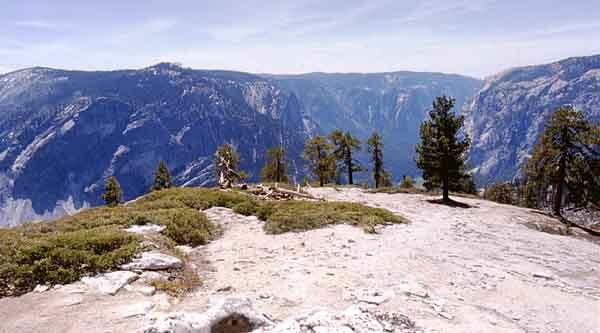 From the valley floor, you can't see behind North Dome because it is so prominent in height. Towering at the edge of the valley wall, it is hard to picture that there is a ridge behind it several hundred feet higher. But there we were. Starting up the ridge, we looked across North Dome. 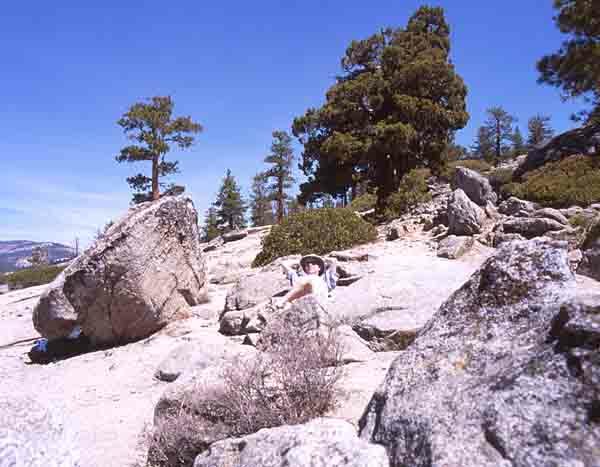 After some brief cloud, blue skies returned to the point where it was shining brightly enough for a suntan, with the reflective rock and all.. so we made our way up and along the wide ridge, and slowly, even in the open areas, we came upon snow pack still a few feet thick. By now it was 2:30 in the afternoon. The trail that could lead us to Snow Creek would have to be off to the right, but must first curve around the large hill in front of us. The trail was there, but it started to descend a few hundred feet and the snow on the slope was clearly getting thicker... but probably only a mile or so before it curved around the back and joined up with the trail we wanted several hundred feet lower in elevation. 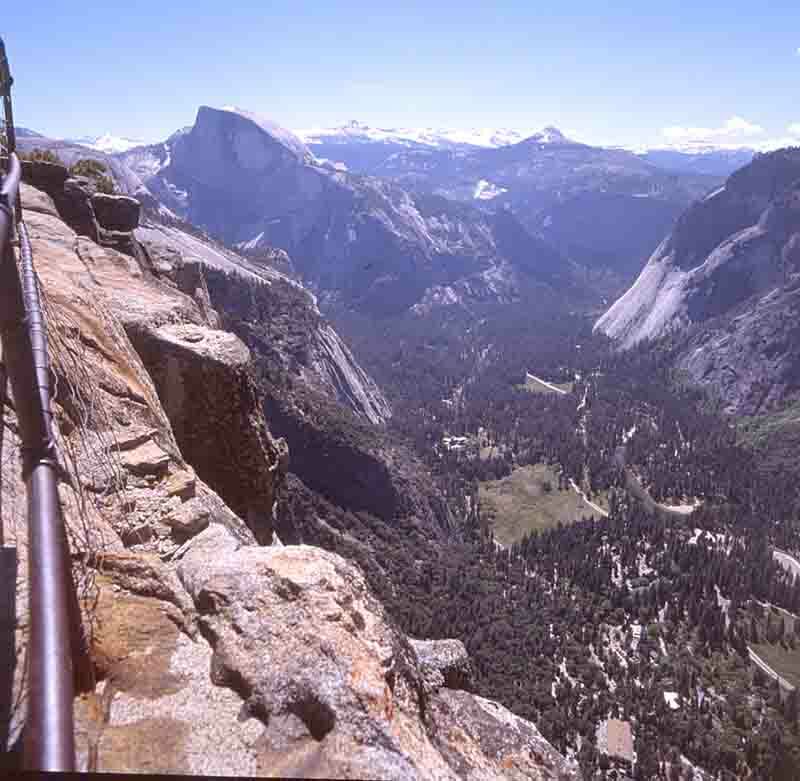 Needless to say, it was good exercise coming back, up and down as each stream cut to Yosemite Point. And thence down along the full trail into the Valley. We were back at the bottom just as dusk settled-and just in time to enjoy a Degnan's large Pizza and tankards of cold beer. After leaving Yosemite, we travelled to Sequoia and had luck enough to get a site for the night. It's a good bit cooler at that higher elevation, yet the weather was clear. 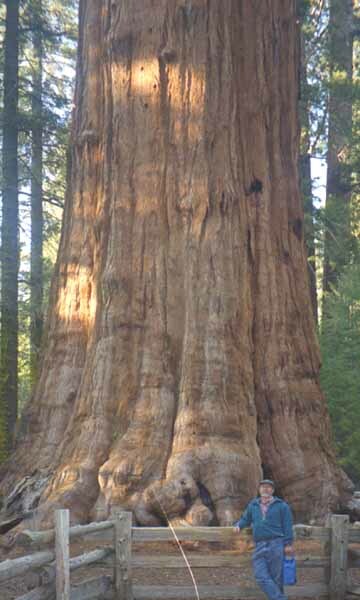 A side trip the next day gave Scott a chance to visit the Giant Forest Sequoia trees, which are truly magnificent. We also stopped at Moro Rock hoping the air was clear, but a lot of dust and pollution from more southern cities obstructed distant views. 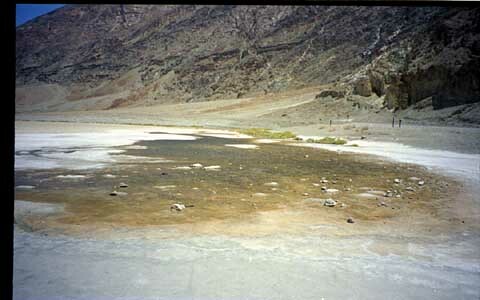 Scott was then keen to see Death Valley so we headed there (again). I could go there four times a year and never tire of it. 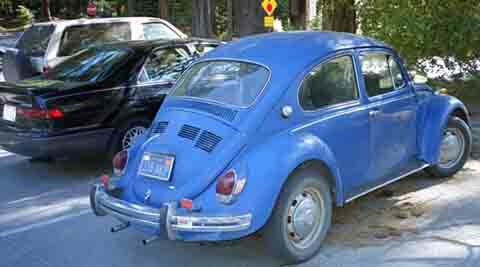 We had a compact car this time, and yet we were able to get as far up into the mountains as the Thorndike campground but certainly not to Mahogany Flat. Here we spend a couple of days, and met a nice couple from Santa Cruz. 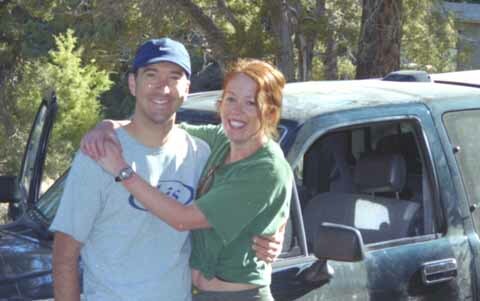 Both of these young people were nurses, out for frequent camping trip. This time, they had quite the experience with their pickup truck. 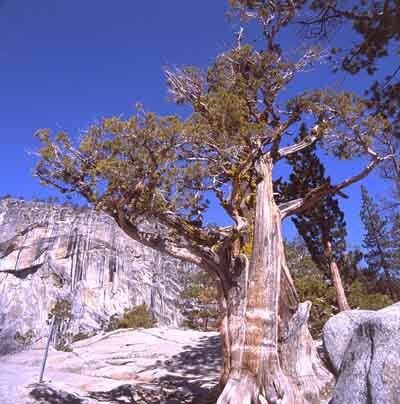 Two days earlier they had arrived here, and were heading up past Thorndike to Mahogany Flat. It sounded like the tires were slipping on the rough road up, but it turned out to be a burned out clutch. The engine revved, but the truck went nowhere. Fortunately, they were able to contact a ranger who happened by, and after some active trolling, were able to get a tow truck way up there. The truck was taken all the way to Ridgecrest ( 100 miles), where repair time was very uncertain due to parts availability. But they were very lucky! The next day, all was repaired, and they were on their way back again. We caught up with them the day after this all happened. So it made a very good story for the campfire. And beer is effective in removing the tough part of the escapade and savoring the success! Scott and I took a road trip the following day into the valley proper, and my claims of warm weather were vindicated. 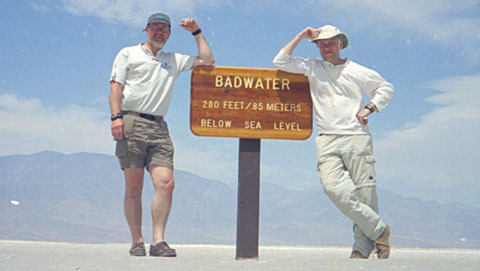 Stopping at Badwater, we posed for a few snapshots. Next, we visited the wonderful bookstore part of the Furnace creek Visitor Center, and decided that with the temperatures and all, the name Furnace Creek was misleading advertising. To be accurate, it needs to be called "Blast Furnace Creek". By the time we reached the shifting sand dunes on the way to Stovepipe Wells, the wind was a steady 10-15 mph and the temperature (at 4:15 p.m.) hit 115F. Getting out of the car felt like instantly transporting yourself to the sunniest, warmest beach on earth. A that temperature, it fells as if the heat you feel is coming from the actual heat of the air and only half from the blazing sun radiating at you! Some people might wish for cooler temps after a couple of days here. We left and blasted north along 395 up toward Tahoe. So of course the weather became more uncertain.... The sky got grayer as we approached the mountains near Reno, and the weather reports got more dismal by the minute. Twenty miles to go, and then it looked as if chain control was going to start any minute. With a rental car (and no chains), this would've meant turning back, and finding another place to stay. So of course, traffic stops because of an accident way up ahead, and the weather keeps deteriorating. Stuck there, sitting, watching the snow starting to swirl, the weather recording getting more dismal. But we got through, to finally reach our motel, while the snowplows were out doing their rounds. The next day was bright and brilliantly sunny as we set out back to San Francisco. 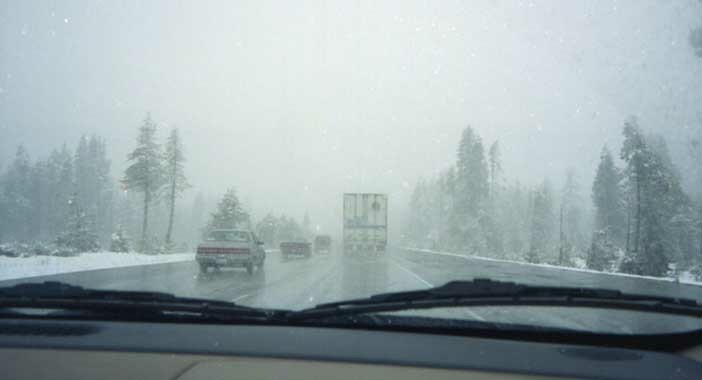 As we descended out of the mountains toward Sacramento, we got to enjoy heavy weather while heading south toward Tracy. That day there were actually small tornadoes in the valley, to keep the black clouds company. We were able to just skirt around all this, while seeing it clearly across the wide horizon approaching up the valley. Back at Motel Six, it was time for a good sushi dinner, so we headed off to the Cupertino grocery store (Momotaro). The last picture of the trip was taken in the parking lot. , The owner of the truck was a big friendly guy with his young daughter along for the ride. He was happy to get all the publicity he could! 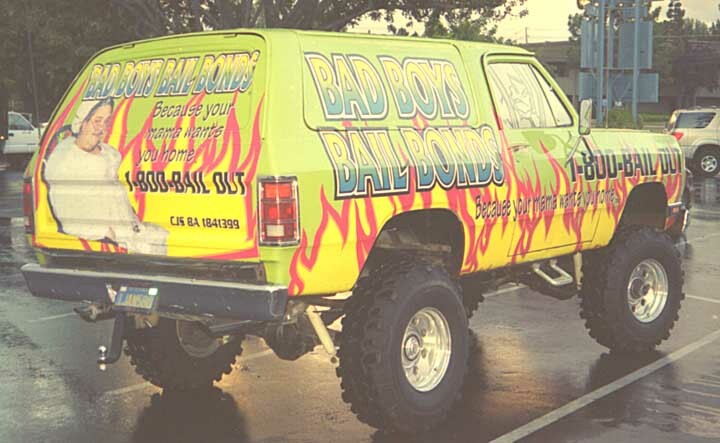 Bad Boys Bail Bonds...1-800-BAIL-OUT ... "Because your mama wants you home..."